The Affinity Diagram is interesting to use and is one of my favourite sense-making tools. It allows you to sort out masses of information into natural groups based on the common characteristics they share or the categories they fall into. It’s also an interactive tool for analyzing the ideas/suggestions you get from brainstorming sessions. It is also known as the KJ Method, after its founder Kawakita Jiro, a Japanese Anthropologist. Discuss with the participants to identify similar ideas and group the similar ideas together as individual categories - You'll need to identify the connections between these ideas. For ideas that fit into more than one category, create duplicate post-it note(s) and place each under the appropriate category. Problem Description: Why are we not making enough sales? With this Affinity Diagram, analysis becomes easier to accomplish. 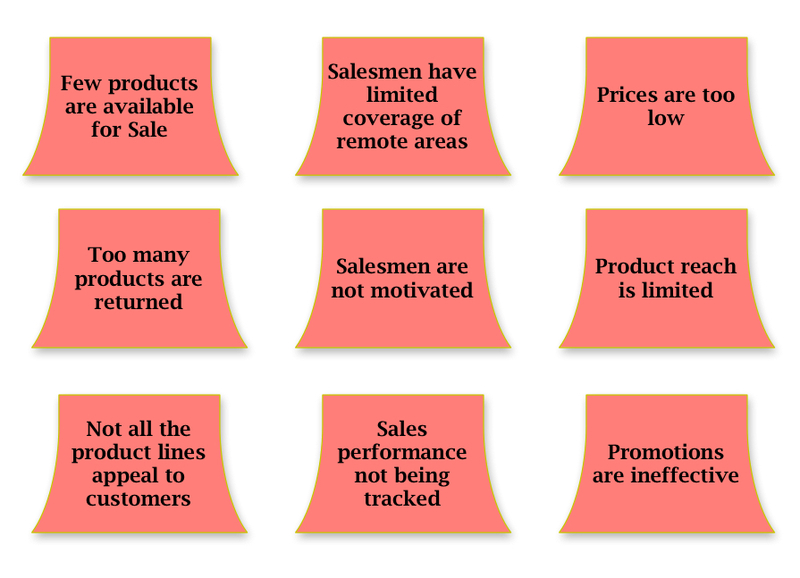 By applying the Affinity Diagram technique, the business areas to be investigated have been revealed: Product, Sales and Marketing. If there were more post-it notes/issues linked to the Marketing Category, it would imply that marketing presents more impediments to increased sales and the BA could decide to focus on that area first. What has been your experience with this technique?